We’ve crafted a home that’s prepared for anything. 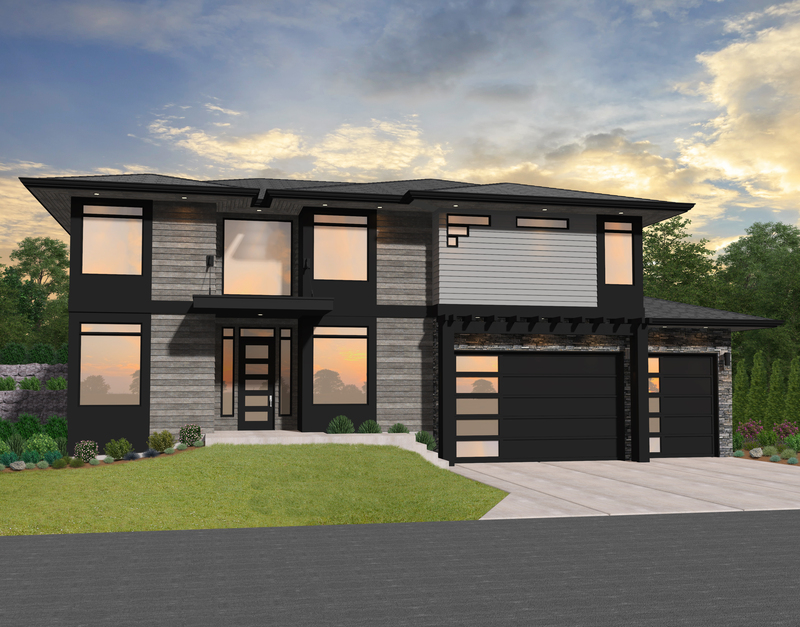 The northwest modern style combines natural materials with sleek modern lines, giving you a house plan with timeless good looks and a layout that works with your life, not against it. Entering the home you’ll find a flexible den to the left and a formal dining room to the right. In addition to the pantry around the corner from the kitchen, the dining room includes a small pass through pantry to the kitchen, making entertaining and hosting a breeze. The kitchen includes a large island with plenty of prep space and an L-shaped layout for ease of accessibility. Just beyond the kitchen is a nook which complements the more formal dining space wonderfully. The great room features an abundance of natural light, a large fireplace, and access to the back patio via the breakfast nook. There is a full second master suite on the main floor at the right rear of the home, and, not counting the den, is the only bedroom on this floor. Rounding out the main floor is a three-car garage on the right side of the home. Upstairs are four spacious bedrooms, including the larger of the two master suites. Upon arriving upstairs, you will be in the large, open, and light filled bonus room. To the left is the fourth bedroom, and to the right you’ll come to a full bath, the second and third bedrooms, and the large utility room which includes shared access via both the hallway and the master bath. The main master suite is spectacular, with a large view window at the rear, a fully featured master bath with full size shower and separate alcove tub, private toilet, his and hers sinks, and magnificent walk-in closet with two equally sized sides, making organization a snap. Also not to be missed on the upper floor is the third bedroom with its large L-shaped walk-in closet.